Flap discs are used in heavy stock removal, often weld removal. They outperform Resin Fiber Discs due to their increased lifetime and last twice as long as Aluminum Oxide discs. To achieve a finish equivalent to a Resin Fiber Disc, always use a flap disc one grit coarser. e.g. If the operator is running a 60 grit Resin Fiber Disc, try a 40 grit flap disc. 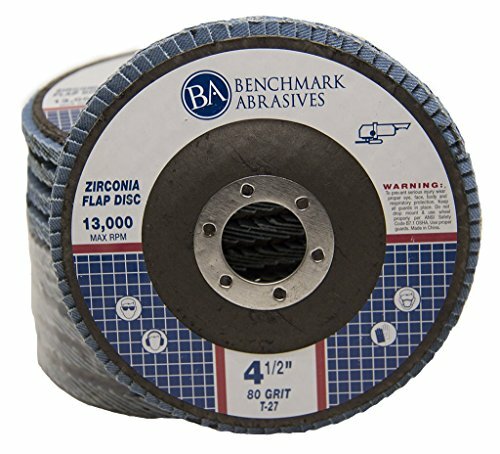 This 80 grit flap disc is made with Zirconia Alumina grain, which is ideal for stainless steel and metal applications while still working well with non-ferrous applications. We use a high quality backing plate to help absorb vibration. Specific suited applications include: weld blending, removing weld slag, deburring, edge blending, surface conditioning and general metal fabrication. Designed for grinding, blending, sanding and finishing on a wide range of material.